Members and friends enjoyed the Club's spring coffee morning today. Plants, cakes and bring and buy stalls were popular with the visitors. It's the Spring Coffee Morning on Tuesday 5th May at The Memorial Hall at 10am. Plants will be on sale for the Autumn Flower Show Plant Competition. This year it will be a Horizon Geranium called Deep Scarlet. This is a prolific flowering zonal Geranium producing deep scarlet flowers. At the Coffee Morning there will be two plants stalls, a bring and buy stall and a cake stall too! So come along for a drink, a biccie and a chat too! With it's unrivalled branching habit and uniform flower growth, Geranium Horizon is one of the best performing upright Geraniums available. 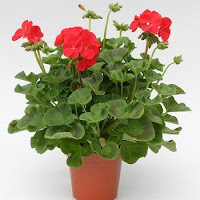 Fast growing, this Geranium is ideal for bulking out flower beds and planting up containers. It is also one of our best selling varieties of bedding plant!